If you're looking for a way to celebrate the Royal Wedding this Saturday, try hosting an elegant afternoon tea party. I suggest serving cupcakes, an all-American favorite, in honor of the princess-to-be*. According to "All About Cupcakes" the cupcake is a bona fide American creation. Cupcake recipes originated in the 19th century; most were known as 1-2-3-4 cakes, an easy way to remember the ingredients required: 1 cup of butter, 2 cups of sugar, 3 cups of flour and 4 eggs. 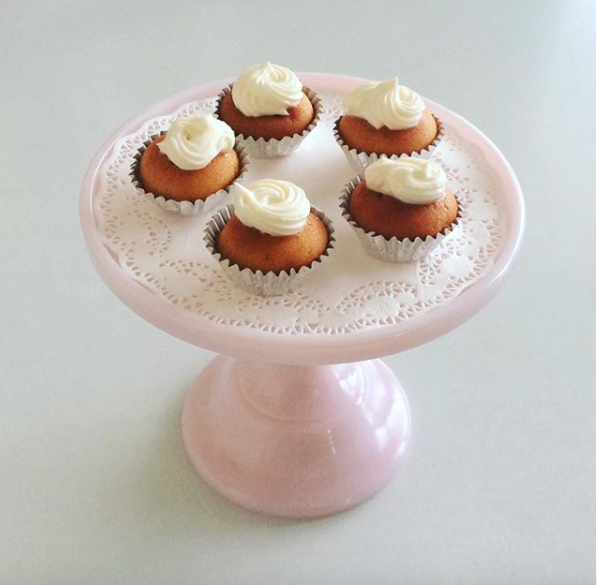 To make dainty mini cupcakes for my afternoon tea spread, I followed Alice Waters' recipe for 1-2-3-4 cake. Waters uses this recipe for birthday cakes, but I think it also works perfectly for cupcakes. The cupcakes taste wonderful topped with Martha Stewart's Fluffy Vanilla Buttercream. Enjoy the cupcakes with traditional British tea such as Darjeeling or Earl Grey. 1.) Preheat the oven to 350 degrees Fahrenheit. 2.) Cut butter into pieces and place in a large bowl. 3.) Add the sugar to the butter; beat ("cream") the butter and sugar until it is light and fluffy. 4.) Combine the flour, baking powder and salt in a medium bowl. 5.) Measure out the milk and set aside. 6.) Separate the eggs into two bowls. 7.) Add the egg yolks to the butter-sugar mixture and beat briefly, then add the vanilla extract and blend it in well. 8.) Slowly blend the flour and milk into the butter-sugar-egg yolk mixture, gently stirring in small amounts at a time until well blended and smooth. 9.) Whip the whites with an electric mixer until they thicken and form a soft peak when you lift up a whisk. 11.) Gradually and gently fold the egg whites into the batter. 12.) Pour the batter into a lined cupcake pan and bake until the cupcakes are lightly browned. To test that the cakes are done, place a toothpick into the center of a cupcake (it should come out clean). Allow cupcakes to cool before frosting. 1.) Beat the butter with an electric mixer on medium-high speed until it is pale and creamy. 2.) Reduce the speed to medium, add 1/2 cup of sugar at a time, and mix for about 5 minutes. 3.) Add the vanilla extract and salt; continue mixing on medium-high speed for about 1 minute until the buttercream is smooth and fluffy. Immediately use the buttercream to frost the cupcakes. English garden roses are the perfect decor! *Officially, Meghan Markle's title is the Duchess of Sussex. Copyright © 2018, Lisa Alexander. All rights reserved.